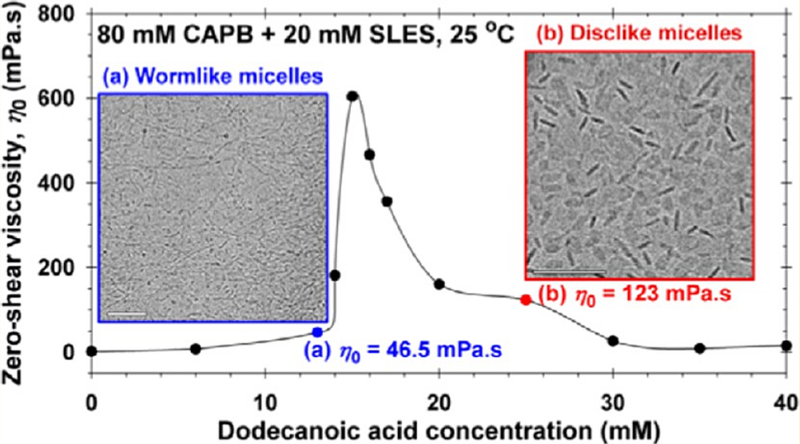 Here, we have investigated the synergistic growth of long wormlike micelles and their transformation into disklike micelles, which occurs in three-component solutions composed of sodium lauryl ether sulfate (SLES; anionic), cocamidopropyl betaine (CAPB; zwitterionic), and dodecanoic acid (HC12; nonionic). The solution rheology is characterized in terms of zero-shear viscosities and characteristic times for micellar breaking and reptation. Furthermore, the microstructure evolution, leading to the observed rheological behavior, is revealed by cryo-transmission electron microscopy (TEM) micrographs. In all cases, the CAPB-to-SLES ratio is fixed, whereas the fatty acid concentration is varied. At a certain HC12 concentration, the solution viscosity passes through a maximum. The cryo-TEM imaging indicates that wormlike micelles appear before the peak, grow further up to the peak, and finally transform into disklike aggregates (a very rare micellar structure) after the peak. The transformation of worms into disks leads to a drop in viscosity because the length-to-thickness aspect ratio of the disks is significantly lower than that of the worms. In this article, we elucidate the structure–rheology relations in micellar solutions that might be applied for the design of personal-care and household formulations.